What Do Barack Obama and Donald Trump Have In Common? It’s rare to see Barack Obama and Donald Trump together, or even to imagine they have anything in common at all, yet there they are in a temporary exhibition at Shanghai’s HKRI Taikoo Hui mall. Well, in a perfectly framed picture, that is, with both looking solemn and suited. Walking through the labyrinthine space, I’m reminded that Brooks Brothers has dressed almost every president since 1818, and has a rich archive of images to illustrate it, including Lincoln, Roosevelt, Eisenhower and Kennedy. There’s even Elvis! A lavish cocktail, exhibition, fashion show and dinner are being hosted by the brand – but the day before the festivities I sit down over coffee with the man of the hour, Claudio Del Vecchio, who acquired Brooks Brothers for a rumoured US$225 million nearly two decades ago then turned it around from its somnambular state. When you’ve been around for centuries, being relevant in the age of social media and youth-based marketing is not easy, but – as Del Vecchio observes – necessary changes stirred the American giant and restored it to its pre-eminent stature in the millennial age. When you were 25, you went into a Brooks Brothers store for the first time. Years later, and you’re one of its longest-serving CEOs. Did you envision this? Not at 25. Probably not even at 40. At that time, I felt I was going to be young and carefree forever. And then life changed, and you never know what’s in store. But I’m very happy that this happened. Are you wearing Brooks Brothers right now? One hundred percent all the time! For the last 17 years, it’s all Brooks Brothers. My favourite is probably the button-down shirts – it’s still what I like to wear all the time. The cut is over 100 years old, but I still feel very much comfortable with that. My closet looks like a Brooks Brothers shop, I built it like a mini store. It’s something that would probably stun you. A lot of shirts, a lot of suits, but for the weekend, casual pants and sports jackets. And shoes. Rifling through the archives, what stands out for you? We’ve always done a very good job of adapting to the times and environment, otherwise we wouldn’t have survived for 200 years. World wars, recession, depression – we lasted because we adapt to those things better than anyone else in that era. Our ability to stay curious, and the need and inspiration to keep serving the customer. But it hasn’t always been smooth sailing. When sales were down, people looked at it as an archaic brand – but you brought in higher-quality fabrics, you resurrected the company. Would you agree with that? It’s a fact that the company is better now than it was for the 13 years when it was under Marks & Spencer. Marks & Spencer paid a lot of money to acquire the brand years ago – it paid five times what I paid for the company, but it was a different situation then. The Marks & Spencer era, well – Brooks Brothers is better now than it was then. But all I’d done, basically, was to resuscitate values that I thought were important. Yes, but for myself. I only dress in Brooks Brothers so I had to make sure that what they had fits my size. I wanted to incorporate better fabrics. What was important to me was what was important to every customer. So it worked. You also brought in Zac Posen in 2016 to do the womenswear line. When you’re so well established in menswear, why, after 198 years, branch out laterally? The company has a very strong male culture, I agree. But we have a head for womenswear, and the team’s mission is to create something that works for women. And I think the customer is recognising that. The women’s collection has been very successful, it’s been the fastest-growing category for us for the last two years. Speaking of the younger generation, we have Red Fleece, our new millennial collection, and women’s is 45 percent of that already. Now our main line is 20 percent women’s. In Red Fleece it’s still growing faster than men’s. So, in that respect, women’s will actually be a bigger percentage of the business than men’s. The younger generation is less prejudiced about the fact that we’re a men’s collection. We’re becoming more of a brand, and a place where it’s acceptable to buy a woman’s product. In the brand’s history, the chapters read like a history of the United States. Many presidents have worn a Brooks Brothers suit, often at their inauguration, Republican or Democrat. I know it’s not good form to talk politics in business, but do you mind which American presidents wear your suits? Everybody wears them. You know, there are only two presidents that we could not confirm whether they have or haven’t worn our suit – at least, we have no proof: Reagan and Carter. But since 1818, every other president has worn it – we have the measurements! We actually have Abraham Lincoln’s measurements in the archive. Lincoln stood at six feet, four inches and required custom-tailoring and he was a frequent visitor. One of his most famous purchases was the coat he wore to his second inauguration. It was not only custom-made but featured a custom-embroidered lining featuring an American eagle and a banner that reads “One Country, One Destiny”. Do they come to you, or do you go to them? I don’t know about before, but in the case of the last two presidents, President Obama’s stylist came to us, and in the case of Mr Trump we let his staff know that we dress every president and that we felt that we were good luck – and they agreed to it. So I went to Trump’s office to measure him and deliver a nice suit and coat for the inauguration. Is Obama the fittest president you’ve ever dressed? Probably yes, he was very fit, in shape. Presidents aside, when it comes to fashion, celebrity is what the current market is focused on. George Clooney in Up in the Air, the cast of Mad Men and Leonardo DiCaprio in The Great Gatsby all wore the brand. Actually, everybody in The Great Gatsby did, not just Leo. We have a very strong PR team that’s working in the entertainment field. Warner Brothers came to us, and said that’s really going to be their target, that it’s going to be a women’s movie because it was going to be a glamorous romance with Leo – but, by the end they realised that there was a much bigger male audience than they expected. When they looked at why, the association with Brooks Brothers was the reason. The way we had promoted the movie brought them much more than they expected. The movie was set in the past, not today. Yeah, but we have a lot of current movies that we dress actors for. We’re not living off of the past, we’re living in today, and we’re looking forward to the future. We may be inspired by the past, but we’re not living in the past. What’s the biggest challenge facing you now? Our biggest asset and biggest challenge is the same. You know, being 200 years old is our greatest asset, but it’s also our biggest challenge because people think they know us, but they actually do not. So when they walk in front of the windows of a Brooks Brothers store, they don’t see what’s in the store, they see what they think is in the store. I read that Japan is your best market in Asia. Now that you’re in China, staging this big event tonight, do you think this will become your number-one market? Definitely within the next two years, China will be our number one. We have only really just started, it’s only in the last two or three years that we have had full control of our own distribution. 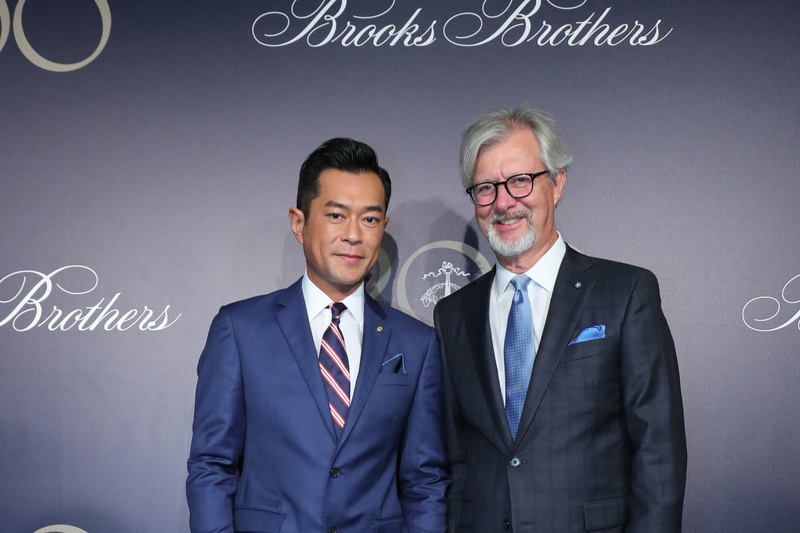 And so now the events this week are a kind of launch, we have a lot of partners and possible partners present today at the show, and we want to show everyone what Brooks Brothers is and what it can be.